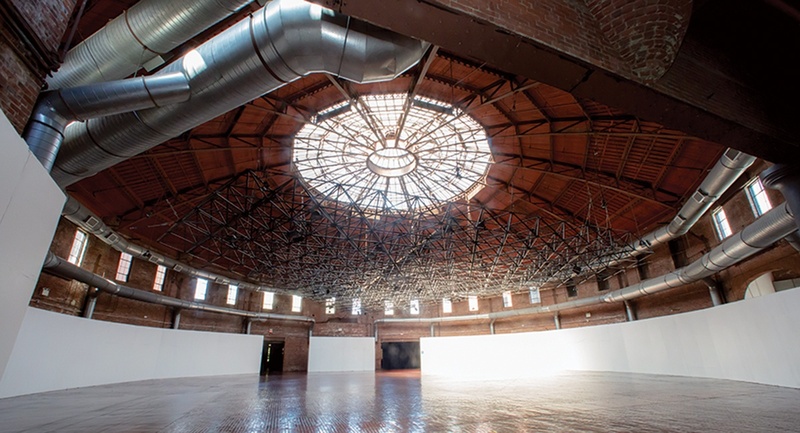 If you’ve attended an event at the Boston Center for the Arts’ Cyclorama—one of the South End’s most unusual buildings—you may have been too busy clinking glasses at that gala, or perusing paintings at that art fair, to wonder: What was the original purpose of this huge round room? And what’s with all the arrow slits and turrets? Turns out, the brick exterior’s fortress-like feel was intentional, because the Cyclorama was built in 1884 for battle—for Paul Dominique Philippoteaux’s panoramic painting The Battle of Gettysburg, that is. After another version was exhibited to paying crowds in Chicago, entrepreneur Charles Willoughby commissioned a cavernous rotunda to house the new canvas in Boston. Architects Charles Amos Cummings and Willard T. Sears—the duo who’d designed Copley Square’s Old South Church a decade before—capped it with one of the largest domes in the country, second only to that of the U.S. Capitol. Philippoteaux’s painting was no less impressive. Nearly 400 feet long and 50 feet high, it debuted on December 22, 1884, when Bostonians packed Tremont Street and paid 50 cents apiece to see it. After navigating a narrow passageway and a flight of stairs, they reached the viewing platform—and found themselves transported to the famed Civil War battlefield of 1863. The French artist spent months interviewing survivors and sketching onsite, and his incredibly realistic rendering seemed to extend for miles in every direction. Props—dirt and debris, canteens, and cannons—provided a 3D foreground, completing the illusion. The word “cyclorama” was coined to describe such spectacular tableaux. The IMAX of the 1800s, cycloramas popped up in many cities, and in the wake of the success of the Civil War scene, Boston’s soon hosted depictions of the Battle of the Little Bighorn, ancient Jerusalem, and a Hawaiian volcano. But the fad soon fizzled. Philippoteaux’s painting—now on view at the Gettysburg National Military Park—languished in an abandoned crate for years. The Cyclorama building, however, continued to see plenty of action. During the 1890s, it offered a panoply of trendy entertainments, including boxing, roller polo, and bicycle riding. Other wheels rolled in at the turn of the century, when the space housed a series of auto shops and manufacturers such as Albert Champion, who invented the A.C. Spark Plug there in 1907. 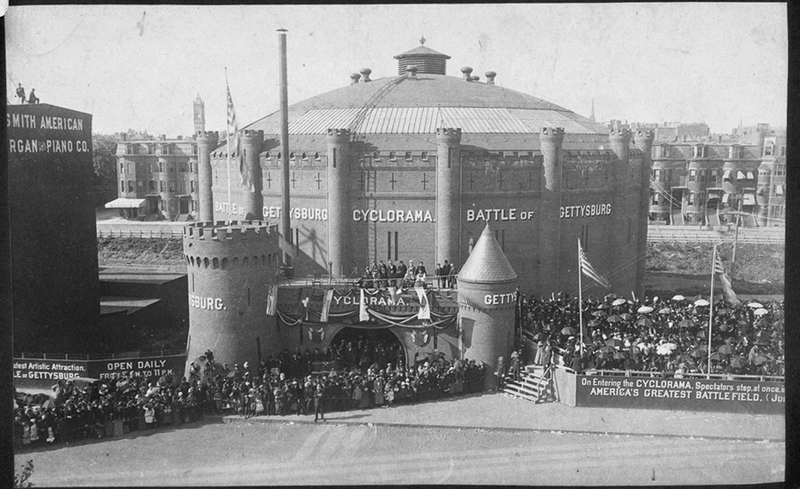 Then in 1923, the Cyclorama turned over another new leaf as the Boston Flower Exchange moved in, razing the feudal façade and installing a skylight. 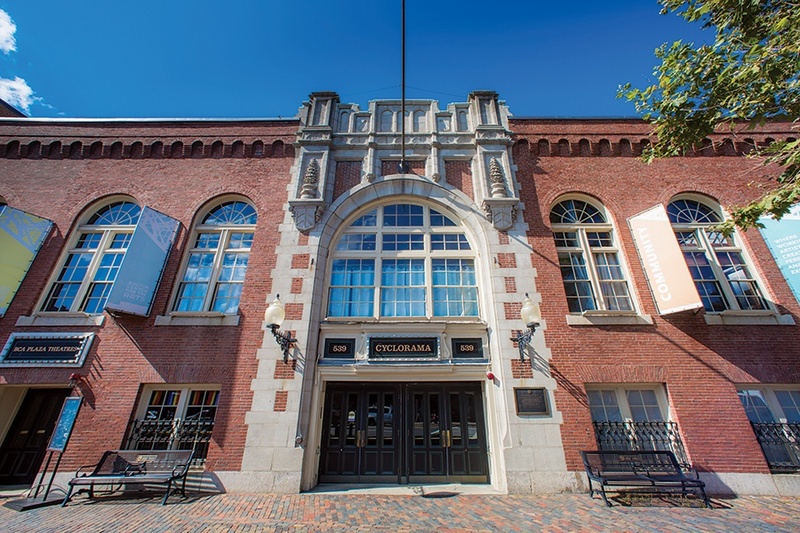 When the exchange moved to Albany Street in 1971, the Cyclorama once again became a home for art. The Boston Redevelopment Authority tapped the newly formed Boston Center for the Arts (BCA) to steward the site, which went on to host works such as artist Judy Chicago’s The Dinner Party. Composed of 39 place settings inspired by famous female figures, the installation prompted the creation of one of the Cyclorama’s most distinctive features: a suspended steel lighting grid, designed by Milton-born polymath Buckminster Fuller to illuminate Chicago’s work.